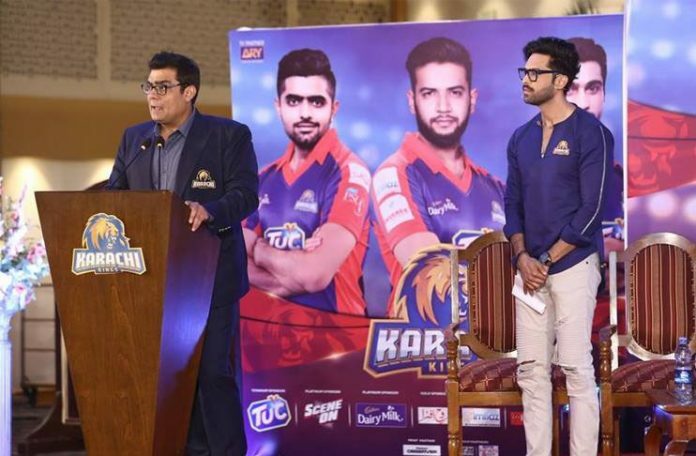 The owner of the most followed franchise of the Pakistan Super League (PSL) Karachi Kings Mr. Salman Iqbal gave full marks to the PSL for bringing back the international cricket in Pakistan. Mr. Salman in anthem launch ceremony of his team Karachi Kings said that the crazy cricket fans in the country wanted to see their favorite stars playing at their home grounds and that becomes possible after the great success of the only cricketing league of Pakistan. “PSL has revived the international cricket completely in Pakistan,” he said. “See in the second edition of the league only final was played in Pakistan, then three matches held here in PSL 3 and now eight matches are scheduled in Pakistan which means that we are on a track for the revival of international cricket in our country,” he added. Mr. Salman said that their team Karachi Kings have gathered the cricket fans on one platform and they need their support throughout. “Cricket fans in Karachi adopted their team. It is the team of whole Pakistan and we are looking forward to their support,” said Mr. Salman who is confident for his team to become the champions of the PSL 4. He praised the PSL for producing young talented players who represented the national team on high. He is also happy as an owner of Karachi Kings which produced players like Usman Shinwari and Usama Mir. The owner of Karachi Kings revealed that many people told him that there will be no profit at all in the PSL but promoting Pakistan’s cricket was his top priority. “Many people asked me to not buy a franchise as there will be no profit but see where the PSL is standing today,” said Mr. Salman who is eying to the most enthralling season of the PSL this time around. The reason behind PSL’s campaign ‘Maidaan Sajana Hai’ also came under limelight when Mr. Salman said that this campaign will help in bringing the entire league to the homeland from next year. “It may turn out to be PSL’s last edition in the UAE, so ‘Maidaan Sajaana Hai’ will serve to fill the stadiums during the PSL matches,” he stated. It is pertinent to mention here that the fourth edition of the league will commence from February 14 with a glittering opening ceremony at Dubai International Stadium. PSL’s Pakistan leg is scheduled to take place from March 7 when Karachi Kings takes on Peshawar Zalmi in Karachi’s National Stadium.